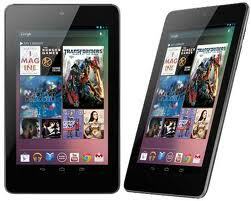 Google Nexus 7 is the most powerful 7.0 inch tablet so far. There is no doubt that the HD resolution will give it a good sales. Many people use Google Nexus 7 to watch movies. If you have just bought a Google Nexus 7, you would want to play videos on the new Nexus tablet. With a 7" Back-lit IPS display with 1280x800 resolution, the new tablet is very great for video enjoying anytime and anywhere. However, the new stuff supports few video formats. So selecting a suitable video converter for Google Nexus 7 is necessary. 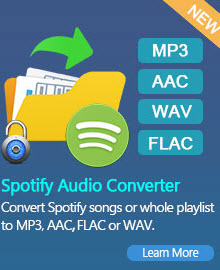 Any Video Converter Ultimate is highly recommended. As an idea Nexus 7 Video Converter, Any Video Converter Ultimate can put almost any video formats such as Tivo, MKV, VOB, AVCHD, MXF, FLV, AVI and etc. to Nexus 7. Besides, the Nexus 7 Video Converter also performs its excellence in video recording and video editing beyond your imagination. Easy-to-use interface, fast converting speed, loaded useful features are all integrated. Free download this powerful Nexus 7 video converter specially designed for you and have a try freely. The Nexus 7 features a 7-inch (180 mm) display, a Nvidia Tegra 3 quad-core chip, 1 GB of RAM, and 8 or 16 GB of internal storage. Incorporating built-in Wi-Fi and near field communication (NFC) connectivity, it is marketed as an entertainment device with integration with Google Play, serving as a platform for multimedia consumption of e-books, television programs, films, games, and music. Many people use Google Nexus 7 to watch movies. By visiting Google Play, we can enjoy lots of hot movies. At the same time, it's also a good idea to stream some local video files to Google Nexus 7 for playing. First of all, let's have a look at the video files supported by Google Nexus 7. As you see, it only supports very limited video formats. However, there are a variety of video types in our lives. Such as MKV, VOB, MOV, M2TS, Tivo, AVCHD, MXF, MOD, EVO etc. These files can't be streamed to Google Nexus 7 for playback directly. You have to convert them in advance. How to convert AVI/WMV/FLV videos to Nexus 7? Any Video Converter Ultimate supports converting all kinds of video formats including MXF, MOV, M2TS, OGM, RMVB, RM, WMV, QT, FLV, MOD, TS, TP, DVR-MS, Divx, etc. to AVI, WMV, MP4, MPEG-1, MPEG-2, FLV, SWF, MKV, 3GP and 3G2. Here the following is a brief guide on how to convert any other videos to Nexus 7 with Any Video Converter Ultimate. 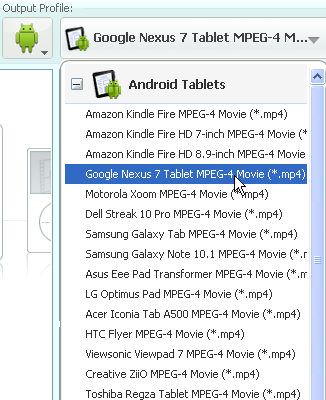 Choose output profile "Google Nexus 7 Tablet MPEG-4 Movie (*.mp4)" in the profile drop-down list. For better enjoying videos on Nexus 7, you can customize video and audio options, such as Video Codec, Video Bitrate, Audio Codec, Audio Bitrate, Audio Channel, Disable Audio, etc. Click Convert Now! button to start converting videos for Nexus 7. Once the conversion is finished, you can click "Output Folder" button to get the output MP4 files. Then connect your Nexus 7 with computer, import output videos into it, and have fun! 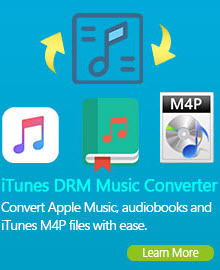 With this powerful Nexus 7 Video Converter, you can easily rip DVD to MP4 video formats compatible with your Nexus 7. Any Video Converter Ultimate is also an excellent DVD ripping software which can help convert both of your NTSC and PAL DVD to MP4 for Nexus 7. Besides MP4 format, the DVD converter can rip DVD to AVI, MPEG, MKV, ASF, WMV, M2TS, FLV, MP3, WMA, etc, with high quality. With Nexus 7 Video Converter, you have the ability to select DVD titles, chapters or segments for the ripping, instead of converting an entire movie into one huge file; copy protected DVD movies; take snapshot from playing video or DVD movie and save as PNG picture format; extract audio from DVD movies and save as MP3, AAC, WMA, M4A, WAVE or OGG audio files for your mp3 players and mobile phones. Downloading and converting online video from YouTube, Nico, Google, MetaCafe, HowCast, Facebook, Liveleak, Veoh, Vevo, Vimeo, myvideo.de to Nexus 7, iPod, iPhone, PSP, Archos and many other PMPs is also available. Just with a few clicks and several seconds, Nexus 7 Video Converter helps you to save the online video in MP4, AVI, WMV or many other video formats for your portable media devices. Nexus 7 Video Converter is an easy to use yet full featured screen recording tool. It allows you to easily capture streaming videos from Hulu, Metacafe, NetFlix, Blockbuster, iTunes, Vimeo, MySpace, etc. It is also available to record anything on the screen including media player windows, protected iTunes rental video, rental DVD movies, online video web pages, rectangular/freehand regions, desktop activities even the full screen.